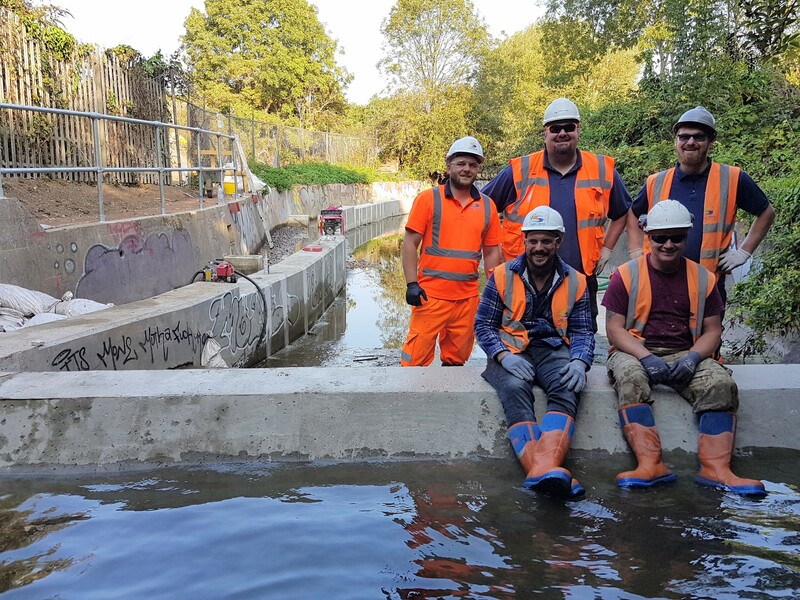 This is part two of a series of blogs detailing our latest work as part of the Hogsmill Connectivity Project. Read Part 1 here. 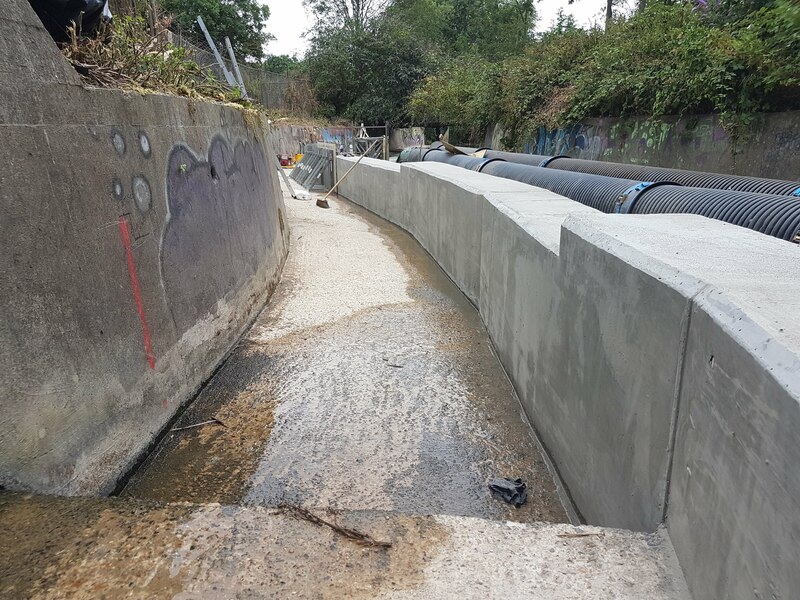 With the factors impacting the ability of fish to pass the Sewage Treatment Works site outlined in the previous blog, a solution or suite of composite solutions would be required to provide passage. In essence, our solution(s) would need to provide streaming flows of a passable depth of water over each of the weirs, whilst also increasing the depth over the concrete river bed. This could be achieved in a number of ways – however when trying to retrofit the solution to an existing structure, with so many constraints, the options become more limited. Still, there were options, and deciding which one to pursue was a case of balancing the requirements against the constraints and finding the line of best fit. For example, the swimming ability of eels differs significantly from the more ‘typical’ fish species, therefore their passage requirements are quite different and would also need to be met with the same solution. 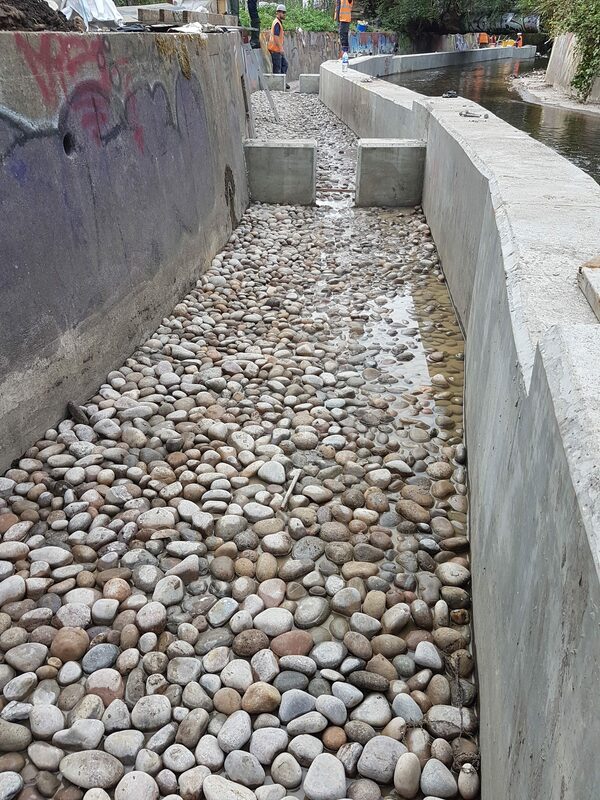 After several options were ruled out on the grounds of flood risk, cost or unsuitable river or fish passage conditions, our chosen solution was a combination of a rock ramp at the bottom of the site and a pool pass through the upper section. Admittedly, the pool pass would not be the most aesthetic or natural fish pass/easement solution – you could almost say we were paying homage to the concrete-obsessed designers and builders of the existing channel! In reality, though, our primary objective was providing fish passage, so when we were confronted with the existing concrete channel, the most robust and best-suited solution was simply to use yet more concrete. 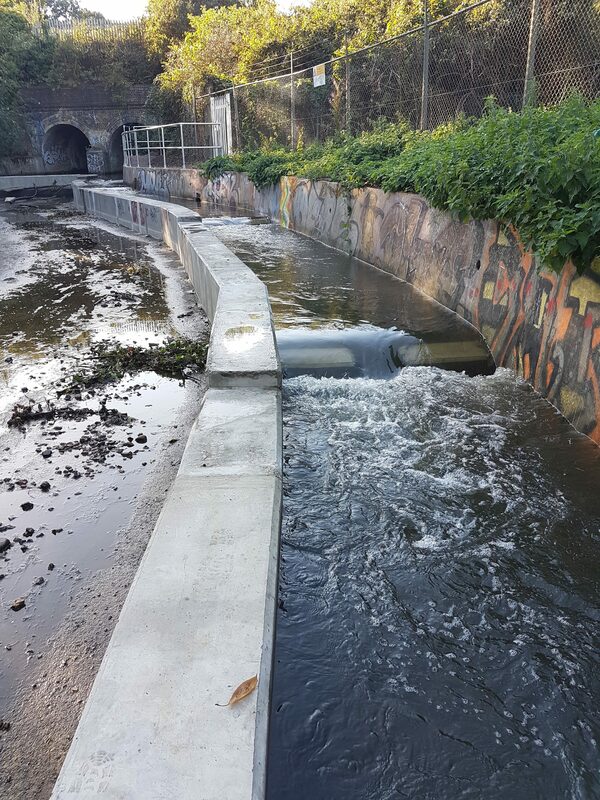 To provide a passable depth of water, we created a narrower 1.5 m channel within the current 7 m channel. The existing left bank wall was used as one of the sides, whilst the other was constructed using reinforced concrete to form a 60 m long wall. This smaller channel would concentrate all low to moderate flows within it. 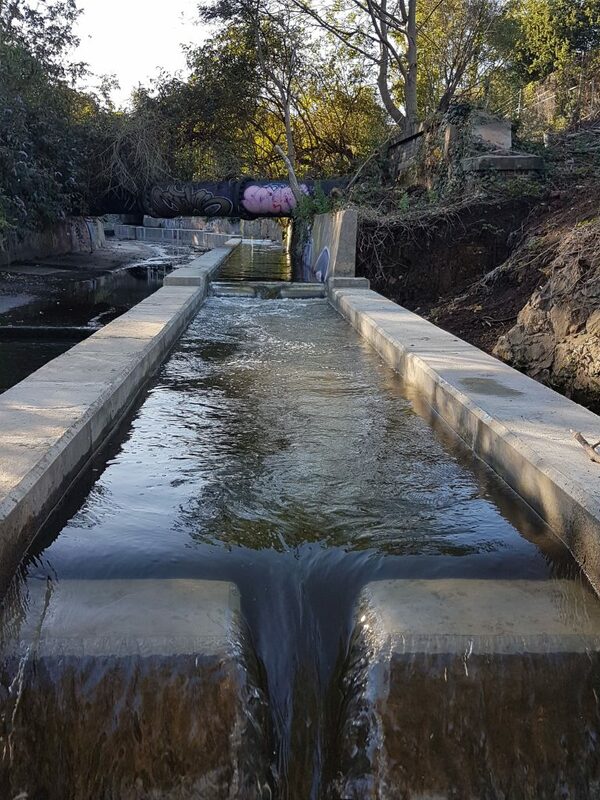 Despite our usual preference for removing weirs, it was ironic that we ended up building another one! This is located on the crest of the upstream weir (barrier 2) immediately downstream of the railway culvert. Its purpose? To funnel the water into the top of the pass, whilst increasing water depths to make them fish passable over the concrete upstream. Along the length of the pool pass, six cross walls (or mini weirs) were built to back up and retain water in the pass. These mini weirs created pools and ensured the water levels overcame barrier 1, the shallow depth and drowned out the upper and middle weirs (barriers 2 & 3). 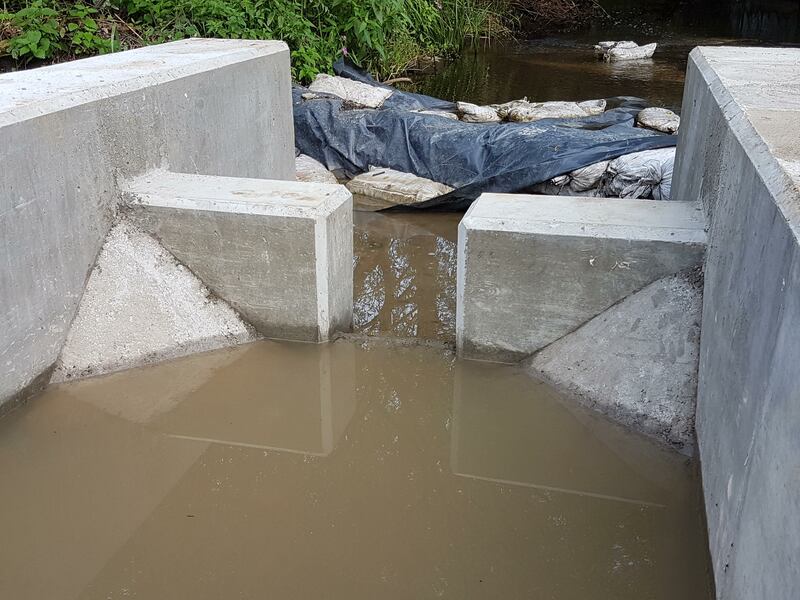 So how did the fish get through if we just created six more mini weirs? Well, in each of the cross walls, a notch focuses the flow and provides a route for fish to pass. With our objective to provide passage for all kinds of fish, we needed to consider the smaller and weaker swimming species. To help them, cobbles were fixed to the bed in all of the pools. This increases the boundary layer, slowing water velocities and providing a medium for them to swim/wriggle through. Eel tiles and bristles were also fixed through the higher velocity notches for the same reason. The pass was designed from a fish passage and hydraulic perspective through a collaborative approach between SERT and the Environment Agency Fisheries Team. 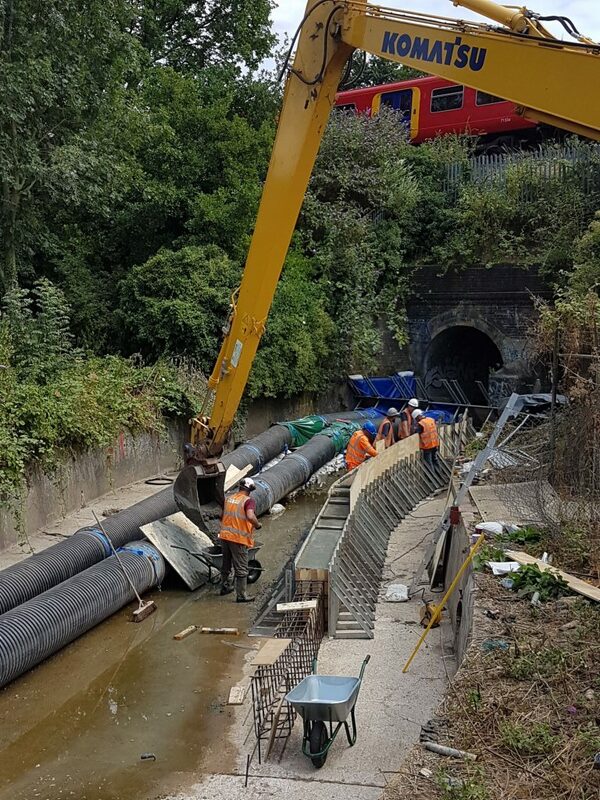 Ensuring the installed structure would stand up to both the test of time and the Hogsmill’s large urban spate flows, Crouch Waterfall, a structural engineer consultancy, dealt with the physics and maths. Our timelapse of the pool pass build. A massive thanks goes to those involved. Darryl Clifton-Dey from the Environment Agency’s Fisheries Team for assisting with the design of the pool pass. A monstrous thanks to Tom Cartmel, Tony Squires and the rest of the Land & Water Services team for their relentless and dogged determination to get the job done right. A top class job!! And of course Thames Water for allowing us to be long-term squatters on the site. Well done to all concerned. I hope the fish appreciate it – no doubt you will be monitoring the effectiveness of this scheme. I think it’s a brilliant job and as a local resident to the Hogsmill I am grateful for all the enterprise and hard work.